We really miss hearing Hank Williams Jr. sing his signature song at the start of the Monday Night Football games. Of course, I AM married to his greatest fan. Been to Hank Jr's museum...Twice. (enough said, lol). But seriously, where's Hank, ESPN?? Well, about a week ago, DH and I flew up to Tulsa, and then a good friend of my husband's, Ron, picked us up at the airport and drove us to Stillwater to see DS Asa and to tailgate before the 1st OSU Cowboys homegame. We did it up right, we went to Eskimo Joe's for Cheese Fries and watched the OU game on the Big Screen and then DS and I shopped at the Student Union (Ca-ching) and then Ron let me have his 2nd ticket to the Club Level to watch the game. Now, for those of us who generally take what seat we can get, sit on hard metal, hope the whimpy wax-covered cup will last ALL the way through the beverage, and get wind-burned cheeks and/or noses, this was quite a coup! THANKS RON! ALL the food was free, even candy bars, cokes and dessert! I have included some "insider" photos here so you can turn ORANGE with envy. Ha, Ha. We have tailgated with Ron and his lovely wife Trish before, along with their DD Bailey. Here is a great picture from a 2005 game. My DH is in the front in a gray shirt and our friend Lisa is on the right. In the spirit of the 'Pokes (nickname for OSU Cowboys), I started making these cute little luggage tags. Perfect take-along project. In OSU colors of course. They are perfect for traveling but also for backpacks. I made them in RH so they would stand up well to normal wear-and-tear. Too cute! The occasion for this post is that I have FINALLY finished Mama's birthday sweater. I normally have a rather strong, creepy reaction to mannequin posed garments, in particular hats on blank staring mannequin heads. However, I am hoping to avoid that crawly feeling by using an awesome antique dressform that my DH bought for me at an auction. It is really a rather cool dressform with a retro flair. I am really proud of my 1st Knitted Garment. It is called "Garnet" by Elsebeth Lavold knit in Classic Elite Premier in Lavendar. I had to take out the shaping on the bottom of the sweater, because my Mama (nor myself, nor most of the female population, I would guess) are not 4 inches smaller at the hip that at the bust!! I also used the largest cast on for the sleeve as I did not want it to be too tight. I also lengthened the sleeve by about 1.5 inches. It is beautifully soft and I hope she'll love it. You can find me on Ravelry under Bethelaking. I have really been enjoying all the features Ravelry has. I think it is like giving an alcoholic a drink...The more I want to crochet and knit, the more I want to post on Ravelry! Ahhh, too fun! I wanted to use up some odds and ends of Caron Simply Soft for a baby afghan and started with a basic wide stripe pattern in a Split 3 Double Crochet pattern (see below for instructions). After I got enough rows for the right size, I decided it was too plain. So I added a 3-dimentional 3-tier shell border. Unfortunately, this picture is from the back so you can't see the 3-dimentional part. However, you CAN see that I successfully (I think) made it look "finished" from both sides. 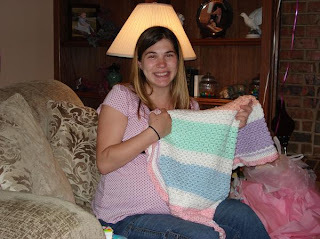 My DD's sister-in-law, Jessica, had a baby shower at just the right time and she got the afghan for Joselynn Rose (born last week). Isn't Jessica glowing!?! I will try and get a picture of Joselynn and the afghan together. And now for the Travel Pictures...Here are my Mama and I at Colonial Williamsburg, VA. Since I am from Oklahoma, seeing living history that far back (100 yrs or so versus 375-400 yrs) was really cool. The 1st pic is of my Mama with the Governor's Palace Gardens behind her. We are standing on the 18 ft. tall ice house that is under ground. The 2nd one is of one of the period houses. The 3rd pic is of me in a covered arbor - great shade on hot days, and boy was it hot that day! The last pic is of a horse-drawn wagon. I bought some neat pewter buttons from a shop there to use on a future sweater. Nothing like planning ahead for WIP. LOL. To do the Split 3 Double Crochet pattern (this may have another name). Chain multiple of 4 plus 1. Row 1: DC in 4th ch from hook, dc in next 2 ch, ch 1, skip 1 ch, (dc in next 3 ch, ch 1, skip 1 ch) across until last 3 ch, dc in last 3 ch. Row 2: (change color here if desired) Ch 3, turn, (sc in ch-1 space, skip next 3 st, ch 3), across, sc in last dc. Row 3: Ch 3, turn, 2 dc in ch-3 space, (ch 1, skip sc, 3 dc in ch-3 space)across until last ch-3 space, ch 1, skip sc, 3 dc in last ch-3 space. Repeat Rows 2 and 3 until size desired. Add border if desired. From Patrick Henry's famous speech in Richmond, VA. I visited Richmond and the James River area last week (my Mama went with me) and took some awesome pictures. The first one is "The Pump House" where Dominion Energy has some offices. It is really cool how they left the "shell" of the building and made modern offices from it. Talk about aesthetic appeal. Next is a beautiful shot from the back of the Pump House and finally a picture of the James River showing the beauty of the water and the large rocks that break up this river. I am sewing up my Mama's sweater and hope to have final pictures soon. It is really turning out nicely (if I do say so myself!). Below is a picture of a baby gift I made for one of my husband's co-workers. He and his wife had twins, 2 girls. I made matching baby bottle covers and booties. I LOVE this baby bottle cover pattern. It is made from pompadour baby yarn and is so darling. 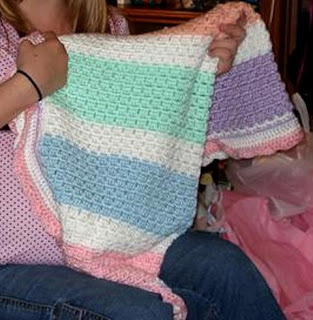 It is from a book I have had for years called Crochet 1 Hour Baby Gifts. I designed the booties myself to match. I recently read that many people didn't know why one would make baby bottle covers. I like to make them for the 4 oz. bottles. Even if the mother is breast feeding they frequently use a small bottle for water or later for juice. These look so special for sending with the baby to church or nursery. Also, baby can hold onto them a little better as they start being able to grasp things.